Welcome to the year 3010. 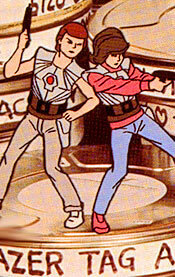 Lazer Tag is the international sport, and the champion is Jamie Jaren - the sole possessor of StarLyte? power, until the resurrection of a master criminal from the past, Draxon Drear.Follow Jamie in these exciting adventures, as she travels through time to preserve the past, save the future and keep the peace. Jamie is the Lazer Tag champion in 3010, who has journeyed back in time to team up with her ancestors to stop Draxon Drear. Drear is a criminal in the close future, who is also related to the Jaren's (it's suggested that he's Nicky's grandson) who is frozen in time and released in 3010 along with his henchmen, the Skugs. He goes back to 1986 to stop destroy the future. Tom is Jamie's distance ancestor who also has the "gift" of using the Starlight as more than just a toy. Beth is Jamie's distance ancestor and the future inventor of the Starlight. Nicky is Jamie's distance ancestor and most of the time has to stay behind. Ralphie is the Jaren's dog. The Skugs are genetically engineered creatures that hang out with Drear. They are some sort of monkey like creature. Mrs. Jaren is the Jaren kids' mom. Mr. Jaren is the Jaren kids' dad who's gullable enough to believe their stories and that Jamie's an exchange student. Charlie is the Jaren's neighbor who is also spying on them and thinks that Jamie is an alien. A Thousand years from now. Estiblished by The Lazer Tag Academt!